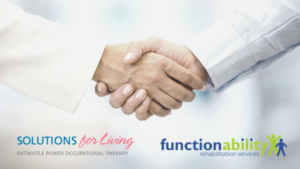 FunctionAbility Rehabilitation Services and Entwistle Power Occupational Therapy are pleased to announce that we have formally joined forces to become the largest provider of third party funded multidisciplinary rehabilitation services in Ontario specializing in the expert assessment and treatment of persons with severe injuries. We are confident that the synergies created by this merger will enhance client care through the integration of respective best practices, as well as, enabling each company to expand their geographic capabilities and scope of services. We thank our community partners, referral sources and clients for continuing to choose our services. In order to keep things simple all contact information, communication process and branding will remain unchanged. Established in 2001 and headquartered in Vaughan, Ontario, FunctionAbility Rehabilitation Services (FunctionAbility) is an accredited, award-winning community-based rehabilitation service that provides community based rehabilitation services across the province of Ontario. FunctionAbility specializes in the provision of third party funded rehabilitation services to individuals who suffer from serious impairments due to trauma. Solutions for Living – Entwistle Power Occupational Therapy works proactively and compassionately with disabled and injured people to help them improve their functional independence in important life roles. At home, work, in the community or during leisure pursuits, our Mission is to provide people with disabilities solutions for living so they can have hope for a better future, are empowered towards independence, and succeed in pursuing functional goals.